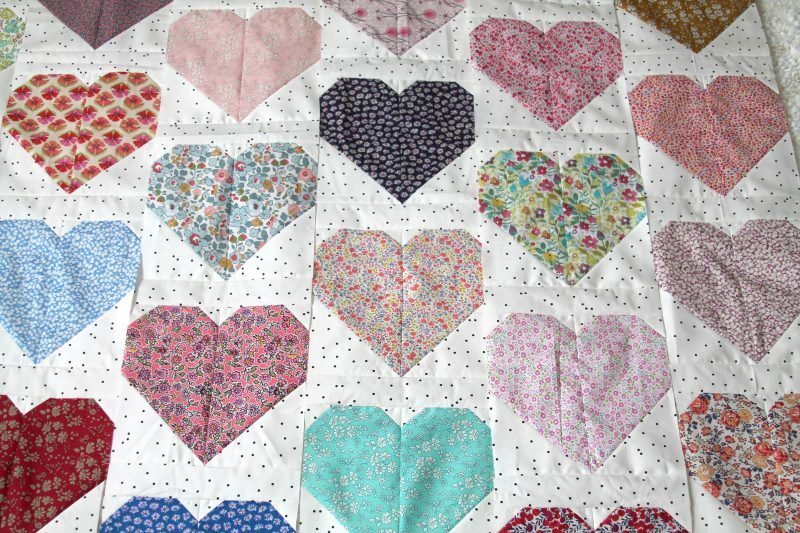 I’ve made a few Valentine-y quilts over the years (2013 (maybe my favorite? ), 2014 with baby Hazel!, 2017 in a snowstorm…), and while I hadn’t had one in mind for this year, suddenly the other day I got the urge to make one. I love Allison’s heart block pattern, and thought it’d be fun to make up larger heart blocks to show off all my favorite Liberty of London prints. I found this black and white polka dot fabric in my stash, which I’ve used, and loved!, for background before (it’s by Bonnie Christine, from her Hello Bear line). I knew I’d be cutting it close, and indeed, I soon discovered that I did not have enough background fabric to finish this one in time for today. 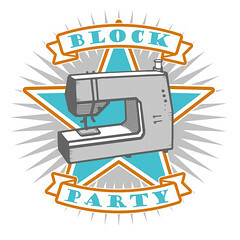 Never fear though, I ordered a bit more from Hawthorne Threads, and hopefully should soon have this one finished! 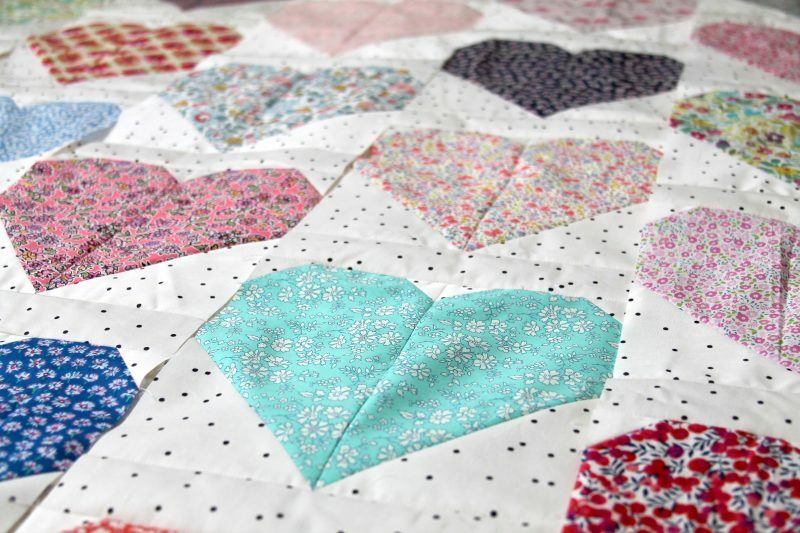 I have a feeling it may be snapped up by one little girl who loves hearts and quilts! It is beautiful! Thanks for the info on the heart block. 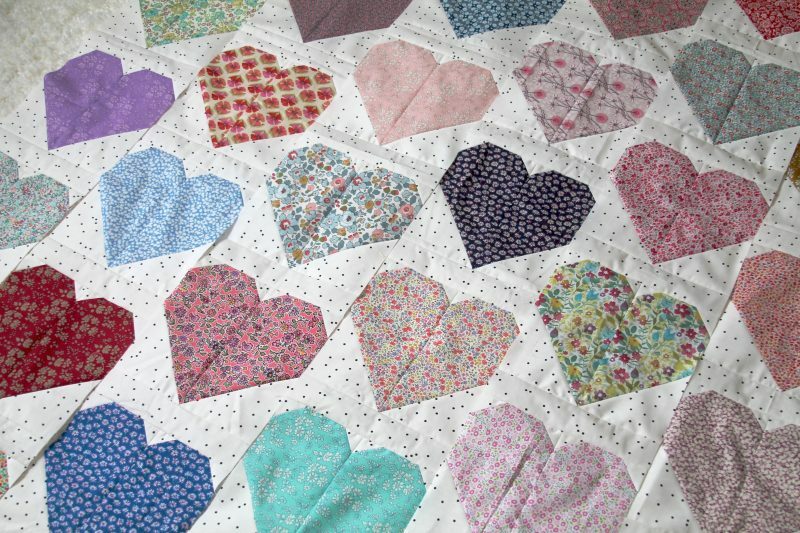 I might be seeing a Heart quilt in my future. It’s gorgeous! 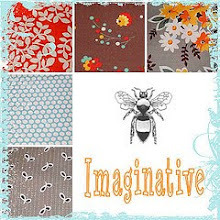 You are genius in this LoL inspired quilt colors! I love this. Thank you for the inspiration. It’s amazing how straight lines end up affecting a rounded soft heart shape. Such a great quilt! I made a 4-heart quit last year for my front door, but this makes me want to make a larger one. Lovely! Adorable! You do fantastic work!! !